Two wide center grooves and deep shoulder lugs form an effective pattern of gripping edges for excellent off-road traction. The groove network also channels water out quickly and efficiently for sure-footed traction on rain-soaked highways. Traction elements are varied in size and shape for quiet running at legal speeds. 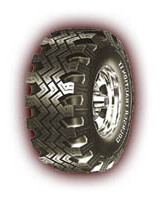 Using the latest computer technology, the tread compound is formulated to combine the materials to provide excellent performance both on the highway and in off-road use.